Hugging the French border with Belgium, Flemish-influenced Lille is a city often overlooked by tourists en route to Paris or Brussels. The city’s industrial past is strongly evident in its attractive city center, grand plazas and historic buildings. Fantastic museums, excellent public transport, a thriving cultural scene and close proximity to the battlefields of WWI, make Lille the ideal place to base yourself for a few days. 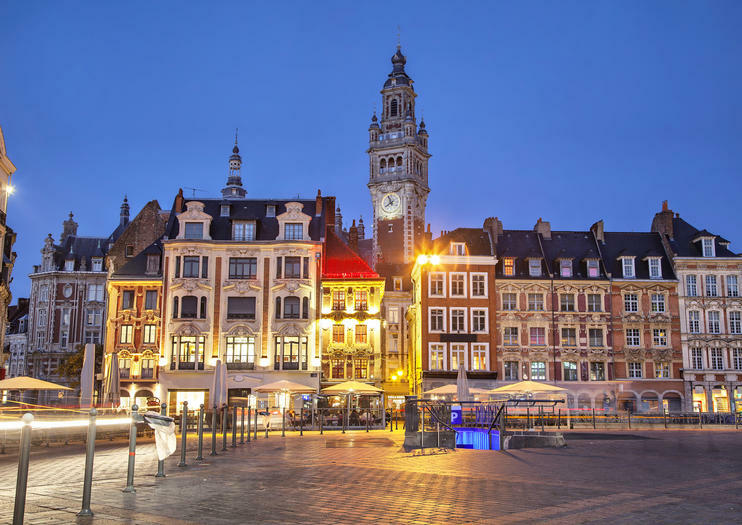 Wander the narrow cobbled streets of Lille’s charming old town (Vieux Lille) and admire the old Flemish town houses, the 1652 Flemish-styled Vieille Bourse (textile exchange), and the Cathedral, with its modern, translucent façade and its Gothic interior. Stop for a while to sample local cuisine in one of the old town’s restaurants or inviting cafes, or browse the boutiques along rue de la Grande Monnaie and rue Basse. To tour Lille’s most important historic attractions without breaking a sweat take a sightseeing tour across town. Not all of France’s best museums reside within Paris as the world-renowned Musée des Beaux-Arts will attest. This fine arts museum is one of France’s best and includes a glorious collection of 15th- to 20th-century paintings by Manet, Van Dyck and Rubens. Moving from old to new… take in the fantastic and downright wacky works by Miro and Picasso, et al at the Museum of Modern Art. And have you ever seen fine art and sculpture displayed in a swimming pool before? Now’s your chance: the Art Deco La Piscine Musée d'art et d'industrie is a unique must-see. Enjoy free public transport and access to many of the city’s tourist and cultural sites (including the Fine Arts Museum of Lille) with the Lille City Pass. Get out of the city on your third day and step back to the early 20th century and the battlefields of the Somme. To most people the Somme signifies one day - July 1st 1916. It was the day that the British Army suffered its greatest ever losses in a single day with nearly 60,000 casualties. See the major sites from that calamitous first day through the whole five months of the battle. See the highlights of the historic city of Lille during a 1.15hour minibus tour of the city. Pass Lille's main attractions, interspersed with pretty parks and gardens, and learn more about this northern French city from its 11th century beginnings to the modern metropolis.